1. Please submit a survey if you want to participate in this exchange. (See second post for Survey information.) Surveys should be emailed to the swap coordinator,mom4x, at crochet_n_4u (at) yahoo (dot) com. Please list the swap name in the subject line. You will receive a confirmation email when your survey is received, and your username will be added to the list of swappers posted below. Surveys can be submitted until midnight on April 29th. Please do not send your survey as attachment- Please cut and paste the survey in the body of your message. 4. Partner assignments will be e-mailed to you on May 1, 2014.. Packages must be POSTMARKED BYJune 10th, 2014. **Proof of shipping is required whenever it is available (see Swap Guidelines for details), and the delivery confirmation number must be emailed or PM'd to the swap coordinator. ** All packages should be received by the end of the swap on June 15th, 2014..
5. E-mail the coordinator,mom4x , at crochet_n_4u(at)yahoo(dot)com when you receive your partner information at the start of the swap, and when you send and receive your exchange item(s) so that she can keep record of who sent and received. Do not PM her through Crochetville. 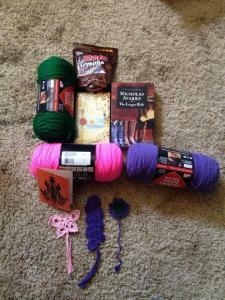 This is in addition to posting to the swap thread that you mailed or received your assigned partner and your packages. Lots of messages are posted to the swap thread daily. Please don’t make the swap coordinator go through all those messages to see if you sent/received your package!!! Remember, these emails are now required of all Crochetville swappers. Failure to do so will result in the accumulation of reputation points. 6. Please thank your partner for their thoughtfulness when you receive your package. It will make his or her day. **Thank-you’s MUST be posted on the swap thread, but you can post links to your blog for photos, etc., if you choose. Thank-you’s are REQUIRED!! **Please also thank your partner personally with a private email, as well as a post to the swap thread. The private thank-you lets your partner know that their package has been received, and the public thank-you lets the other swappers know what you received and adds to everyone’s enjoyment of the exchange. Both a public and private THANK YOU is required. 7. Make sure your postage and receiver's address are correct before mailing. Mark your package with Crochetville Bookmark Swap. Do not forget that delivery confirmation (or other proof of shipping) is required whenever it is available, and the delivery confirmation must be emailed to the swap coordinator. This provides proof of mailing in case your package is lost during transit. 9. If your package is not postmarked by the Mailing Deadline ofJune 10th, 2014, you will be subject to the consequences listed in the Swap Guidelines. Please contact the swap coordinator BEFORE the mailing deadline passes if there is a problem. 1. What is your full name (for mailing purposes only), and C'ville nickname? 4. Are you willing to exchange with a smoker? 6. Does anyone in your household smoke? 10. What are your favorite colors? Are there any colors you don't like? 11. What kind of bookmarks do you like? Long, short, frilly, cutesie, etc. 12. What sort of books do you enjoy reading? 13. Do you want a seasonal or specific bookmark? 14. Can you send to a foreign partner? 15. Have you participated in a swap at C'ville before? Which ones? 16. Are you already signed up for two swaps? 17. What extra goodies do you enjoy? (tea, coffee, cocoa, etc -- these aren't required items for this swap, but this info is useful if your partner wishes to send some extras). 18. Have you read all of the swap rules, both for this specific swap and the 2011 Swap Guidelines? And do you agree to follow these rules? 19. Anything else you want your partner to know? You should remove your address from the post, well actually you need to send this information via an email to mom4x, so you should remove the entire post. You are probably new to swaps, so ask questions if you have any. Please submit a survey if you want to participate in this exchange. (See second post for Survey information.) Surveys should be emailed to the swap coordinator,mom4x, at crochet_n_4u (at) yahoo (dot) com. Please list the swap name in the subject line. You will receive a confirmation email when your survey is received, and your username will be added to the list of swappers posted below. Surveys can be submitted until midnight on April 29th. Please do not send your survey as attachment- Please cut and paste the survey in the body of your message. Linda, I'm Patty and I'm the swap coordinator here on Crochetville. I edited your post to remove your last name and address for your privacy and safety. I know other forums and boards have people submit swap surveys to the thread, but we don't for several reasons, the most important being your Internet safety. Please read through the guidelines, which tell you exactly how to play, and resubmit your survey to your swap hostess. Welcome to our swaps, and I hope you have fun. Bookmark swap is one of my favorites! Partner received & emailed Just waiting on an email back!! 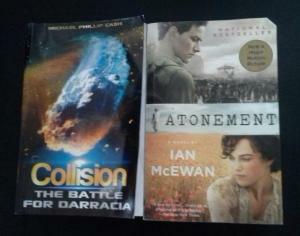 I've already got the books, just need to get the bookmarks done! This swap got me to look for a used book store close to wehre I am and I found one in my town - super excited! There's also another 10 minutes away int he next town over! Hello Jessica got your info. sent you an email. One of the swaps that I look for. Love this swap. I love reading and I love bookmarks This swap would be perfect for me BUT I didn't join it, because of where I live. I can buy some books in English here but they are double expensive. When I wanted to read Betty Hetchman's detective crochet stories, I ordered them from England but it took almost two months to come to me.... So I'll watch and admire the bookmark you'll make. Enjoy! Shipping deadline is quickly approaching. Please keep me updated ladies. Mom4x, my package will go out tomorrow! Just put it in the envelope! Jessica's package will go out tomorrow. I'm leaving for the post office now (Had to wait for DD to wake up from nap) and will email you as soon as I have the receipt!! Mom4x & AngelFairy - Emailed you AngelFairy's Tracking #!! I received my package from Brenda on Saturday!! Can I just say THANK YOU!! 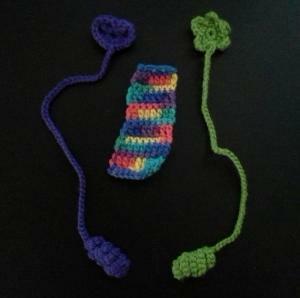 3 Beautiful Bookmarks crocheted out of Thread! Which is awesome because I can't get thread to work with me! Yesterday I receiced my package from Jessica, Thank You. Ever since I saw the movie commercials, I've wonder about the book, not usually what I read but maybe one of this days I might try it. I hope you and your family are well and no more car trouble. Take Care. Brenda. Great packages and swap. I guess we are finished up. I hope you ladies had a good time. Thanks for making it a smooth swap. I had fun with this one!! Books are a big passion of mine, so being able to receive new books & share other books that you like is great! !